Browse > Home / Dog News / Nineteen Pups! 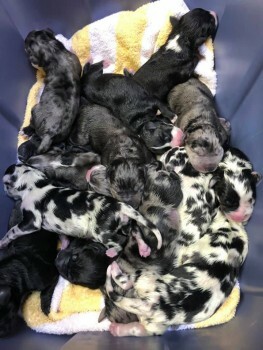 The staff of KAH (11 of us) successfully delivered 19 Great Dane puppies this morning by C Section! All live and healthy! Mom doing great! These puppies do not belong to KAH or any of the staff. Thank you all for the kind words and congrats to the momma dog and our hard working staff that came in for this emergency. Holy cow, that’s a lot of puppies!